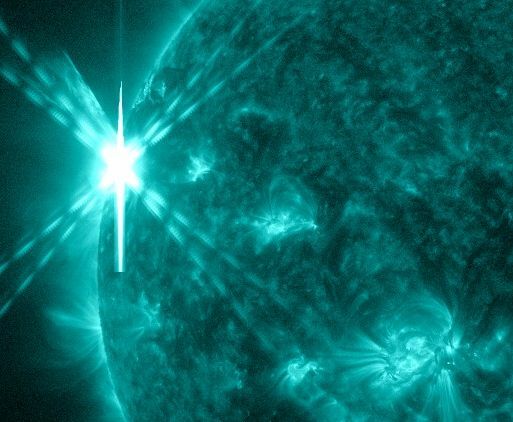 A pulse of UV radiation and X-rays from the flare caused a strong radio blackout over the Pacific side of Earth. This map shows the extent of the blackout, which affected frequencies below 20 MHz. Mariners, aviators, and ham radio operators are the type of people who might have noticed the disturbance. The explosion also hurled a CME into space: movie. Traveling faster than 1100 km/s (2.5 million mph), the expanding cloud does not appear to be heading for Earth. 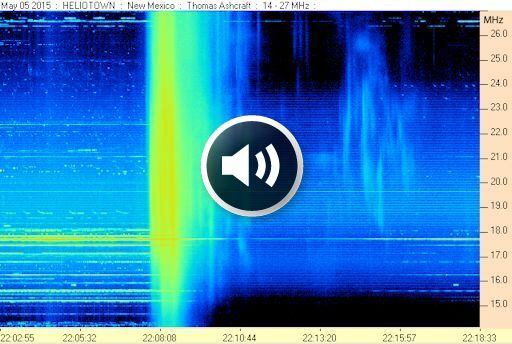 What caused this burst of “solar static”? The same magnetic explosion that caused the flare also produced beams of electrons. As the electrons sliced through the sun’s atmosphere, they generated a ripple of radio-loud plasma waves. Astronomers classify solar radio bursts into five types; this one was a mixture of Type III and Type V.